Nobody tells you how wonderful being a grandmother is. I don't remember anyone saying to me "it's amazing being a Grandma/Nana!" I had no idea grandchildren brought so much joy into this stage of life.....until I had my own. Why is it such a well kept secret? Is it because we'd be pressuring our children into producing some grandbabies for us to love if we knew how much fun they were going to be? I probably would have started hinting much earlier in the piece if I'd known how delightful it would be to have a grandchild to love. 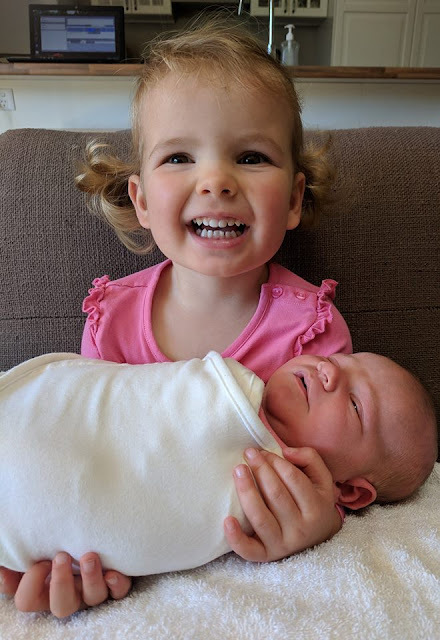 Our son and daughter-in-law were kind enough to have a little girl, Sophia, in April 2016, and they have just brought her baby sister, Georgia, into the world a month ago. We live an hour and a half's drive away, and each time we couldn't wait to meet them. These tiny little bundles that aren't ours, but at the same time feel like ours. They are a part of my husband and a part of me - as well as being parts of their parents and their other grandparents. We lament the fact that we don't get to see them more than once a month or so, but when we do get to visit - or they came to visit us, the time we have together is longer and more precious. Seeing our first granddaughter grow from a little baby into a toddler and then into a two year old has been so special. As a grandparent you get to enjoy all the easy parts of children without the tiredness and tedium that are part and parcel of parenting. I have very few clear memories of my own children as babies and toddlers because I was so sleep deprived. They were a huge part of my life and I think we did a pretty darn good job of raising them (they've certainly turned out to be very fine human beings) but it's a bit of a blur trying to remember all the little stages of their early years. With grandchildren it's different, you're wide awake and anticipating the time you get to spend with them. You notice how much they've changed since you saw them last. You are greeted at the door with delight and smiles and excitement. To hear Sophia saying Nan! Nan! Nan! brings such a smile to my face. To chase around after her, or to sit and play little games is so easy when there are no other demands on my time. Now there is a second baby to love and spoil (yes, I get told that I never spoiled my children but I'm a pushover when it comes to Sophia - and will be with Georgia too I'm sure!) and life just keeps getting better. Two little girls are going to be calling me Nan, and two little girls are going to give me squishy hugs and wet kisses. I have two little girls in my life who are being parented so well and behave so beautifully. I'm so proud of our son and daughter-in-law and the job they're doing to raise them with love and discipline. I'm not sure why I wasn't told that being a Nan would be almost as wonderful as being a Mum. Maybe people said it and I didn't believe them? Now I shout it from the rooftops and I will be forever grateful that these two little darlings are part of our family. I've discovered a whole new side to myself, a part of me that is just theirs - and I love that it feels like a reward and a blessing for all that's led up to this moment in time. Now I just have to convince our daughter and son-in-law that it's their turn! No luck so far, but my motto is "never say never!" Are you a grandparent? Did you know it was going to be so much fun, or was it a big surprise for you too? Aren't grandbabies just the best?! The girls are gorgeous! My Mother always said if she could have by-passed being a Mother and go straight to being a Grand Mother, she would have! Of course she was right! I'm not sure why they capture our hearts so completely Haralee - maybe it's the fact that there's all the good stuff and none of the hard yards? Your mum is very wise! My mom always said, "If I knew how much fun grandchildren would be, I'd have had them first!" OMG, Leanne. Your grandchildren could not be cuter. Lucky you! I think I'm a few years away from this event, but still can't wait. I think you were exactly the same as me Deb - you knew that you'd love them, but not what a special place in your heart that they take up! I get so much pleasure from my visits to see them - and I don't remember my kids being excited to see me when they were little - I was part of the wallpaper of their life - whereas I'm special when I visit the girls. It's so lovely watching your children parent well and to be able to sit back and smile and enjoy the snuggles. I love the idea of writing your memories down - they slide away so quickly don't they? What a wonderful post, Leanne. Sophia and Georgia are absolutely gorgeous. 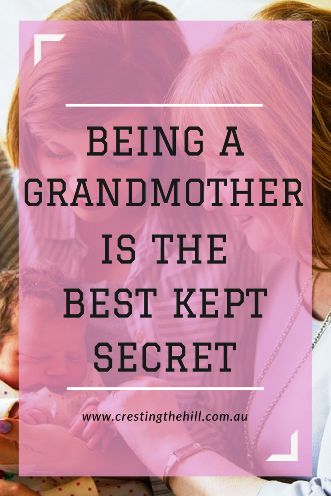 I had been told about this "secret" much earlier...but I never really understood it until I held my grandchildren in my arms! My husband and I don't have children. If somehow we could have figured out how to have grandchildren, though, we probably would have. 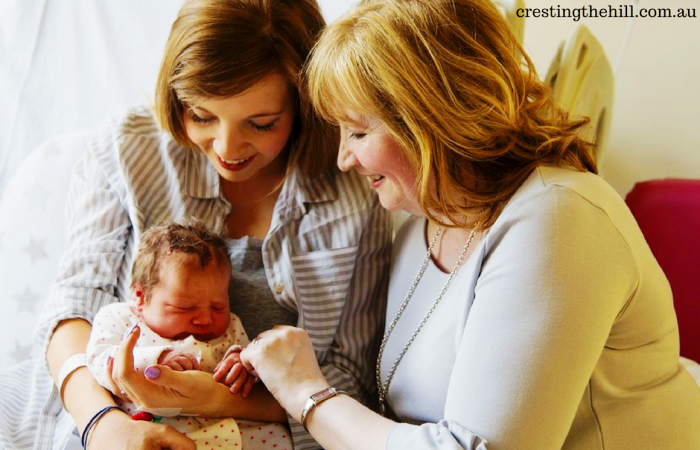 Your granddaughters are so cute (but you probably already knew that :) ). If there was a secret to skipping all the hard work and commitment of parenting and just sliding into the lovely stage of being a grandparent we'd all want to know it Janis. I've wondered at times about all the effort and sacrifice that goes into parenting well - and it's nice to have a little reward for all those years of investing ourselves in our kids. I'm sure you'll manage to snuggle a great niece or nephew or two in the years ahead. Maybe it's a cultural difference? I feel like, in the States, people rave about being grandparents, and sometimes people who are currently parents even joke about having kids just so they can be grandparents down the road. At least, I hope they are joking. When I married a man whose oldest was already in his early 20s - older than any of my nieces and nephews - someone joked that, for not having kids, I might turn out to be the first grandparent of my siblings! Not yet. Aussies definitely aren't as full on as Americans Red, so maybe we downplay things more down here? I think you've hit the jackpot of skipping all the hard yards of parenting and just sliding into cuddling grandkids - smart move my dear! Shared on my social media. Hi Leanne, your little granddaughters are so adorable and perhaps arranged marriages might be the go with my two grandsons LOL:) I agree that nothing prepares you for the love you feel when you grandchild is born. I just adore my two grandsons and Ethan has taught me so much during his 4 years. I'm lucky to live nearby so can share fun times with them and I just love the special bond we have. I'm sharing on social media and congratulations! My husband has turned out to be a wonderful grandfather too Jennifer - so different to my own dad who had very little to do with my kids and never kept up with what interested them - it was the standing joke with my kids that their grandfather was always at least 10 years behind and never knew what they were studying or doing - I'm so glad my grandgirls won't have that as an example of grandparenting! It was his loss though. It's funny how it's such a surprise how much we love them isn't it Jennifer? We expected to love our own kids, but I had no idea of the flow on effect that this next generation of little people would have. To have that special bond is so unexpected and so lovley. Beautiful post. Sometimes I lament the fact that my children's grandparents do not seem to feel the way so many other grandparents do. They will happily miss out on important things and not be present in the moment. I look forward to it, myself. We said the same thing about our kids' grandparents Becky - they were just not that interested in their grandchildren - there was some involvement, but not the same sense of joy and connection that we feel with our grandgirls. I'm sure, when your time comes, you'll be like me - just loving the joy of another generation of babies in the family. My son was 25 when he suddenly settled down Patrick - so you never knows what lies around the corner. Then the grandbabies come. Mind you, our daughter is 29 and not showing any interest in producing some of her own - even after 5 years of marriage. So who knows what the future holds? Totally - it really is the best. Someone did tell me it's better than having children, certainly easier in a support role, and they were right. I'm very blessed to see mine every day or two as well, which is wonderful. I certainly didn't have that relationship with my grandparents. Maybe it's our generation that are making it into something more special Chris? I know my grandparents weren't as in love with us as we are with our grandkids - and our parents weren't as besotted with our kids - not sure what brought about the added delight, but I'm glad we get to experience it. There is absolutely nothing better than grandchildren. We have eight 2 boys and 6 girls. And our oldest has two little guys so we have great grandchildren. It is so good to get all of the fun and none of the responsibilities. I cannot believe that you're a greatgrandmother Victoria - when I read your blog you seem younger than me, so to imagine you with grown and married grandchildren when I'm just beginning is really hard to get my head around! There was no such secret kept away from me. I saw the joy my mum got as grandmother to our two and my brothers two. In fact Mum and our daughter spent a lot of time together as I was teaching and Mum often helped out with coming to our house and cooking baked dinners. I also had a grandfather who doted on me and an aunt. I was so ready to be "Grandma" and I was at the same age my daughter is now!! She Is "NOT" wanting to be Grandma for sometime as she had kids aged from 21 to 6! It is the best role I have ever had and only last night my 21 yo GD were reminiscing about my caring for her in one of the houses I showed we had lived in on IG. It is special but it is far better than being a parent!! You are so lucky that both your parents seem to have been ahead of their times Denyse - your father was happy with you going on to tertiary education, and your mum was a such a good grandmother and support person to you - very blessed indeed my friend! You're so lucky to be able to see them all the time Christie - and to have your grandson every morning - complete with fun greeting ritual is just lovely. I'm looking forward to the girls coming to stay with us when they're older - and I hope they enjoy it as much as we will. Being a Grandma (or in my case, a Nana) is something that you just don't understand until you join the club. I feel the same way about my boys' younger years...it tends to be a blur of memories. But I savor every minute of the time I have with the grand kids and the memories we are making now. It really is the most wonderful type of relationship! Your two are precious! I had the complete opposite experience of you. EVERYONE, and I mean EVERYONE, told me how great being a grandparent was, and I struggled to believe that as I never had a desire for a grandchild. Now that I am a grandma, I know what everyone meant! I love my grand baby so much and I cherish every second I get to be with her. I don't think I'd have believed them either Amy - it just doesn't sound feasible that a small child who isn't your own baby can hold such a special place in your heart - I love that it's been such a wonderful discovery. I totally agree! I've got two - grandsons, ages 4 & 8. Alas, both of my boys (and hence both grandsons) live in Arizona & I'm in Texas - a whole flight away, so I don't get to see them near often enough. I'm glad you're much closer to yours, although an hour and a half is still too far to be from a grandchild! I console myself with the fact that an hour and a half is nothing compared to those who have grandchildren in another State or overseas Trisha - but gee it would be lovely to live 5 minutes away! 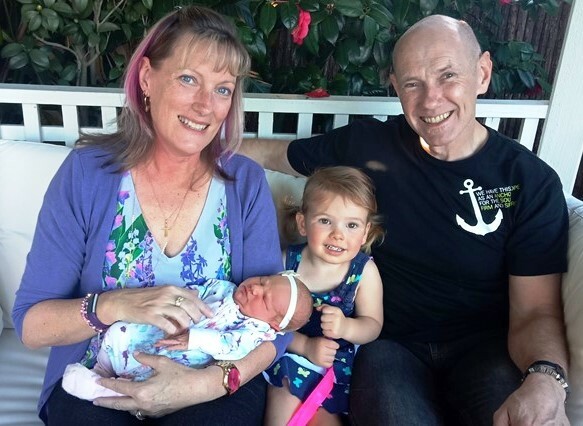 I totally agree with you that grandparenting rocks! Enjoy those beautiful grandchildren. It does indeed rock Sally - and I'm so glad I got the opportunity to find out - imagine if neither of my kids had wanted to have children! No grandchildren for us at this time. All three kids seem pretty set against kids, for now. Many of my friends are grandparents and are really loving the whole experience. Only time will tell for us, we have time as our kids are still pretty young. Your time will come Cherie and at least you know now that it will be wonderful - I bet you'll be smothered in grandbaby love before you know it - time seems to fly very quickly at this stage of life! I'll admit, I was apprehensive about the role, but there's nothing like being "Bam" to my two little cuties! Leanne - I'm still a few years away from grandchildren - but I've seen my siblings and my own mother's reactions to grandchildren. I look forward to the joy -- if it ever happens. Thanks for sharing your grandchildren with us - they are adorable. 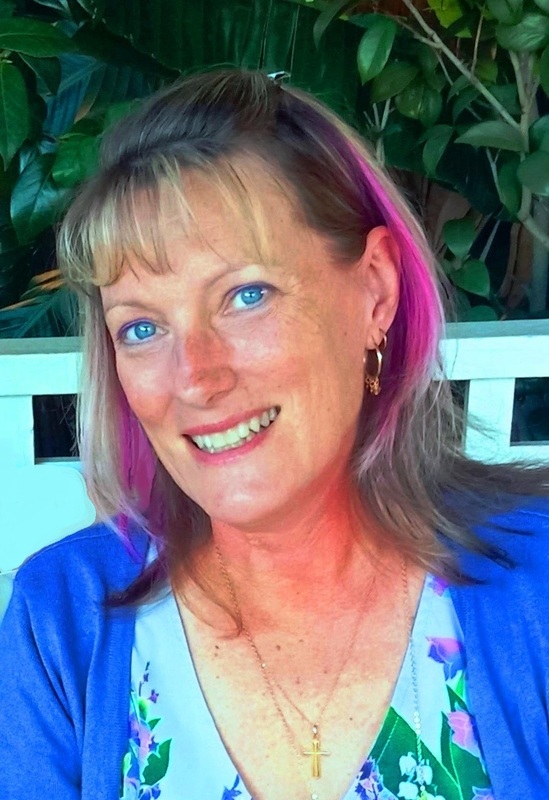 ARE YOU BECOMING MORE IN MIDLIFE? I WAS A VICTIM OF THE DREADED MAN FLU!